These side cases give you plenty of storage for those long trips and are easily detachable when you don’t need them. Got valuables? They even lock for security. Cold wind and hands don’t get along. These will help deflect that wind to keep your passenger’s hands nice and warm. ARS (Arctic Race Suspension) combines tall ski spindles and widely spaced A-arms for the greatest torsional rigidity and strength. The lower A-arms mount to the chassis at an angle from the chassis centerline, with optimal caster/camber angles to improve comfort and cornering traction while reducing bump/steer. The one-piece spindle construction with balljoints eliminates the added weight and stiction of spindle-in-housing designs. Our SLIDE-ACTION Rear Suspension incorporates a U-shaped front-arm slot that fits over a shaft bolted across the tunnel. This creates a half-inch of sliding movement, which keeps the front arm from torque locking and helps keep the skis planted during acceleration. 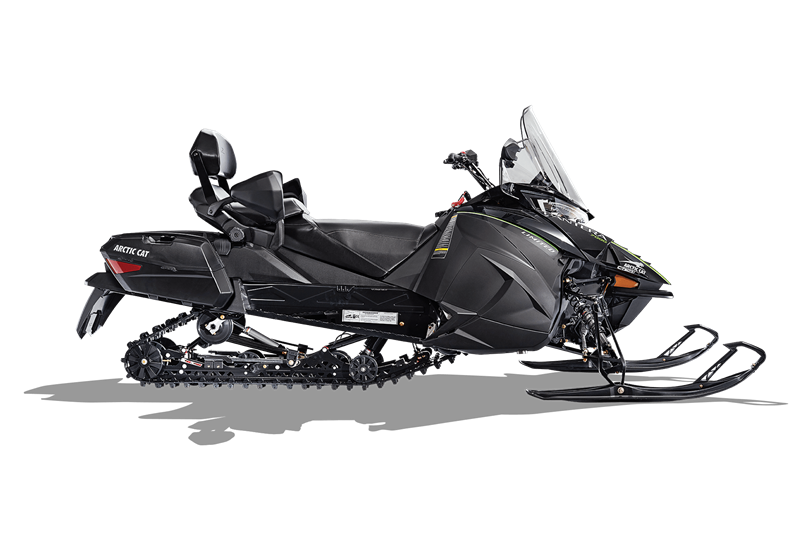 Add in our Arctic Cat (IFP) shocks and you’ve got comfort and confidence even in the bumpiest conditions. Looking for more comfort on long rides? This easy-to-adjust backrest allows you to dial in the just right amount of support. With our heated driver’s seat, you stay warm and comfortable even on long rides. The unique lug design of the Ripsaw™ track provides excellent performance. This 146″ track offers 1.25″ lug height for optimal traction in a variety of conditions. Conveniently placed to easily power up whatever you need. A place for everything, and everything in its place. Whatever you’ve got, our storage cases will keep it safe and dry. If you’ve got a heated helmet visor, we give you the outlets you need to plug in and get rid of that visor fog.